I was on yet another airplane this week and it occurred to me that aviation is, at present, completely and totally dependent on fossil fuels. Naturally curious I started doing some digging about oil futures etc. on line and it comes down to this (yes, I am paraphrasing in a BIG way) The optimistic view is that the world's oil reserves will be gone in 40 years. The pessimists say 20 years. For arguments sake lets say that the earth's oil supply will be gone sometime in the next 30 years. This will no doubt have a profound impact on, well, everything. There are electric cars, boats, lawn mowers, etc. But electricity is simply no solution for aviation. An electric airplane? So my conclusion is that Aviation's present methods of propulsion are doomed. To my mind there are no alternatives. When you think about the impact that will have on the global economy it really is difficult to contemplate. Suffice it to say that it is an intimidating thing to ponder. I'm no conspiracy theorist and I have always considered myself an optimist but this has one has me stumped and a bit concerned. I think an obvious solution is rail. The advances in rail travel continue to significant. However there is no economically viable rail solution for crossing oceans. Most modern rail systems, including the high speed rail systems in Europe and Asia, are electric. I've blogged about using AutoCAD Civil 3D as a design tool for rail design so to all of you way-over-the-horizon thinkers who's job it is to do long term market predictions specific to civil engineering I say think rail - and use your frequent flyer miles while you can! At least until someone has a moment of clarity about an alternative to kerosene for turbines and AVGAS for piston engine aircraft. Hydrogen perhaps? Hmm, remember the Hindenberg? "CEMENT kilns contribute more to the world's output of carbon dioxide than aircraft and could soon be responsible for 10 per cent of all emissions of the greenhouse gas. 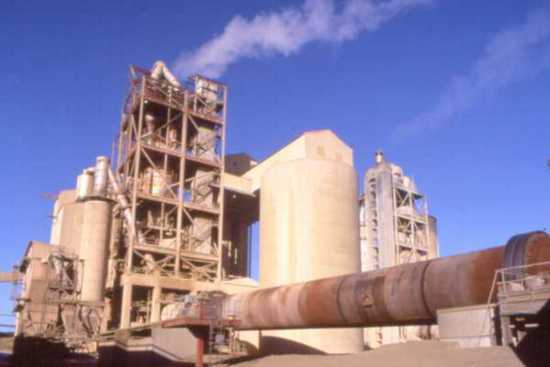 New calculations by an industry scientist reveal that cement manufacturers already produce 7 per cent of global CO2 emissions—almost three times previously published estimates—and that CO2 output is increasing faster from cement works than from any other industrial source." Thank you, Sandy, for the sending this to me! Got an interesting story, bit of trivia or a cool Civil 3D tip or trick? Send it to me. 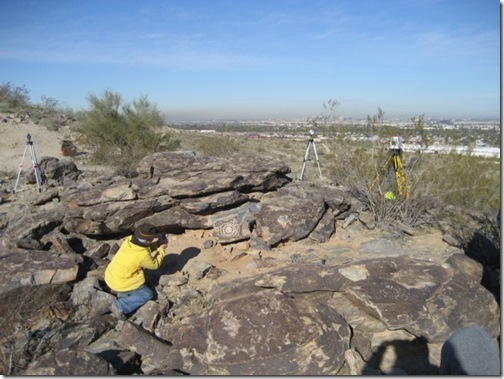 On December 28 my friend Scott Cedarleaf with Plowman Craven Associates asked me to meet him and representatives from the Gila River Indian Community, the City of Phoenix, Arizona State University and the University of Arizona at South Mountain Park. The purpose of the field trip was to demonstrate the combination of 3D laser scanning and Autodesk software. Similar to my work on Easter Island this trip had an archaeological focus. The attendees were all very curious to see how laser scanning and the resulting 3D models could help them in their work and research. As expected once the group got to see the point clouds generated by the scanner the conversations about how the technology could be applied heated up. If you too are curious about how to work with laser scanning data and Civil 3D check out CloudCUBE from VirtualGEO. If you are really serious about laser scanning I recommend that you attend the SPAR conference in Houston. I'll see you there! As you know, Autodesk is very serious about promoting sustainable design. Regardless of how you feel about global warming or the environment, it is clear that employing sustainable (a.k.a. green) design practices simply makes good sense. At present, there are 6.6 billion of us on the planet. Conservative projections put the world population at 9 billion by 2042. I know, I know, it seems somewhat hypocritical for a guy who has spent his career "paving the whales" (sorry, an old, and not very good civil engineering joke) to start promoting this issue. Actually, I have considered myself fairly "green" since day one of the very first geology class I took in college back in 1981. The professor started off with a few ground rules. The first had to do with evolution/creationism (I won't touch that one). Second (and this was the part that hooked me), he said, "For those of you pro-environment types, let me correct you on one key fallacy in your argument. We are NOT killing the planet. Throughout its 4.5 billion year history, the planet has been through cataclysms you can't even imagine. Several mass extinctions where 98% of all life was exterminated, meteor impacts, volcanic eruptions, climate change, magnetic pole reversals, etc. and recovered from all of it." "So", he concluded, "we are NOT killing the planet—the planet will be just fine. We're killing ourselves." Fortunately, sustainable design has gone from trend to necessity and I'm happy to report, it is actually proving to be a really good investment from a business standpoint. Here are three stories about Autodesk customers who are doing the smart thing, the right thing . . . and prospering. I have been fascinated with LIDAR technology for quite a while, but earlier versions of Civil 3D could not handle the huge files (point clouds) that this technology creates. Instead, I have been forced to remain patient while Civil 3D matures to where it can deal with huge numbers of LIDAR generated points. And that time is now! A friend of mine, using a beta of Civil 3D 2008, just told me the good news. He imported 850,000 points to C3D 2008 and made a surface in a total of 6 minutes. The key was to use “no display” styles for everything. The resulting drawing was 75 MB. The original LIDAR files totaled 40 MB. He then created a shortcut for the surface. Next, he created a new drawing and a reference object for the surface displaying contours. A REGEN took 5 seconds. A 10 km corridor with 20 m assembly insertion (500 assembly insertions) took 10 seconds. What’s the buzz behind model-based design? So have you ever wondered what’s the back-story, the dirt, behind model-based design and why the trade magazines devote so many pages to this subject? If you sit back from your PC for a minute and think about the civil/survey industry and the changes we’ve made over the years, it should become clear that, just like CAD and GPS, model-based design is simply a long-overdue evolutionary step. In truth we’ve been lagging behind the mechanical and architectural industries. Model-based design is a 30-year-old concept to the mechanical community and even the architects are well ahead of us. Autodesk Revit, a model-based product for architectural design has been gaining momentum for several years. Model-based design is finally available to us who deal in dirt. It represents a quantum leap forward for us by cutting design and drafting time in half. Not convinced? Am I sounding too much like a guy with an Autodesk business card? Consider two new industry trends that are experiencing explosive growth: machine control and LIDAR. Machine control is the term used to describe GPS-controlled earth moving machinery. Guess what? This technology is completely and totally dependent on the terrain model that is uploaded to the machine. It’s model based. LIDAR (Light Detection and Ranging) uses the same principle as RADAR. The LIDAR instrument transmits light out to a target. The transmitted light interacts with and is changed by the target. Some of this light is reflected/scattered back to the instrument where it is analyzed. The change in the properties of the light enables some property of the target to be determined. The time for the light to travel out to the target and back to the LIDAR is used to determine the range to the target. LIDAR scanners create large files called "point clouds" at rates of up to (and above) 12,000 points per second. Now that’s surveying! Point clouds are 3D and extremely accurate relative to the range from the LIDAR instrument . . . and, yes, the point clouds are models in the truest sense. Catch my drift yet? I’ll go out on a limb and predict it won’t be long before we civil engineers will be exchanging and combining our models with architectural models. It only makes sense and the GIS community is waiting for us to get it done.